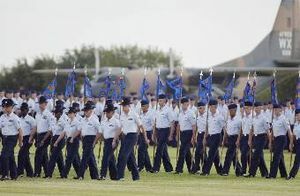 New Airmen participating in the Basic Military Training graduation parade. Lackland Air Force Base (IATA: SKF, ICAO: KSKF, FAA Location identifier: SKF) is a United States Air Force base located in San Antonio, Texas. The base is under the jurisdiction of the 802d Mission Support Group, Air Education and Training Command (AETC). 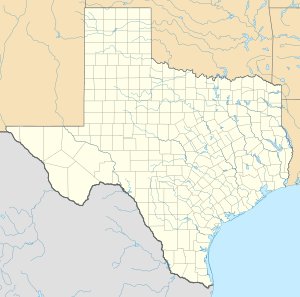 Lackland AFB is part of Joint Base San Antonio, an amalgamation of the United States Army Fort Sam Houston, the United States Air Force Randolph Air Force Base and Lackland Air Force Base, which were merged on 1 October 2010. Joint Base San Antonio (JBSA), which includes Lackland Air Force Base, was established in accordance with congressional legislation implementing the recommendations of the 2005 Base Realignment and Closure Commission. The legislation ordered the consolidation of the three facilities which were adjoining, but separate military installations, into a single joint base – one of 12 joint bases formed in the United States as a result of the law. Lackland AFB is named after Brigadier General Frank Lackland. It is the only entry processing station for Air Force enlisted Basic Military Training (BMT). It shared this status temporarily with Amarillo Air Force Base during the Vietnam War until Amarillo AFB's closure in 1968. Lackland AFB hosts a collection of vintage military aircraft on static display on its parade grounds, including a B-52 Stratofortress, F-4 Phantom II, SR-71 Blackbird, C-121 Constellation, B-17 Flying Fortress and a B-25 Mitchell. A unit of the JBSA 502d Air Base Wing, the 802d MSG is the focal point for all base activities, serving and supporting the 37th and 737th Training Groups and all of its mission partners as well as the more than 24,000 retirees living in the local area. Provides Air Force Basic Military Training for all enlisted people entering the Air Force, Air Force Reserve and Air National Guard, earning Lackland the nickname, "Gateway to the Air Force." Fostering enduring Inter-American engagement through education and training. Teaches 37 technical courses, in Spanish and in English, to students from more than 22 countries every year. Primary mission was to teach English to Allied pilot candidates. In 1966, its mission expanded to include other career fields, and the school moved under the DoD with the U.S. Army as the executive agent. Organizes, trains, equips and presents assigned forces and capabilities to conduct intelligence, surveillance and reconnaissance for combatant commanders and the nation. It also implements and oversees the execution of Air Force policies intended to expand ISR capabilities. Extends, operates and defends the Air Force portion of the Department of Defense network and provide full spectrum capabilities for the Joint warfighter in, through, and from cyberspace. Interfaces with theater and functional Air Operations Centers to establish, plan, direct, coordinate, assess, and command & control cyber operations in support of AF and Joint warfighting requirements. Lackland Air Force Base is home to the 37th Training Wing (37 TRW) which operates a variety of training squadrons. Within the 37th TRW is the 37th Training Group (37 TRG) which oversees the 5 technical training schools on the base, and the 737 TRG which oversees the Basic Military Training squadrons. A Staff Sergeant Military Training Instructor (TI) at Lackland in 2009. RH&T dormitories in background. A group of Airmen taking part in the Airman's Run, the final run before graduation. Lackland is best known for its role in being the sole location for U.S. Air Force enlisted Basic Military Training (BMT) for the Active Duty Air Force, Air Force Reserve and Air National Guard. BMT is organized into 9 basic training squadrons, each with their own training site on the base. Each squadron is equipped with either a dining facility or a medical clinic. Some BMT squadrons share dining facilities if they are located close enough together and the same is true for medical clinics. Each squadron also has a specific exercise area where basic trainees conduct physical readiness training (PRT). Also, AFOSI anti-terrorism teams are trained here. In October 2008 the BMT was expanded an extra two weeks to implement more air base defense training as well as other rudimentary skills. It is now sitting even with the Navy's Basic course at 8½ weeks. Lackland, like many other Air Education and Training Command (AETC) bases, trains enlisted airmen out of basic training in a specific specialty via various "tech schools." Lackland currently has six technical training squadrons on base training multiple airmen in various Air Force Specialty Codes (AFSCs). The 37th TRG supports the following five training squadrons and also trains technical training instructors, military training instructors and military training leaders. The 341st TRS trains military working dogs and handlers for the entire Department of Defense and several federal agencies. The 342nd TRS teaches Pararescuemen, Combat Controllers, Special Operations Weathermen, Tactical Air Control Party members, Survival, Evasion, Resistance and Escape (SERE) Specialists, Explosive Ordnance Disposal and a variety of advanced Security Forces courses. The 343rd TRS trains airmen to become Security Forces members in a 13-week academy. The 344th TRS provides technical training for more than 10,000 active duty, Reserve, Guard, international and civilian students annually in Career Enlisted Aviator, Vehicle Maintenance, Logistics Readiness Officer, Logistics Plans, Materiel Management, Contracting, Recruiting, Safety, Cryptological, and TEMPEST courses. The 345th TRS trains, develops and educates technical training students into skilled graduates in the Services, Air Transportation, Hazardous Material Transportation School (HAZMAT) and Traffic Management Office career fields..
Construction on Lackland Air Force Base began on 15 Jun, 1941, and it was originally part of Kelly Field. One year later, it became an independent organization—the San Antonio Aviation Cadet Center. On 8 January 1943, the War Department constituted and activated the 78th Flying Training Wing (Preflight) at San Antonio and assigned it to the AAF Central Flying Training Command. The 78th provided aviation cadets the mechanics and physics of flight and required the cadets to pass courses in mathematics and the hard sciences. Then the cadets were taught to apply their knowledge practically by teaching them aeronautics, deflection shooting, and thinking in three dimensions. Once completed, the graduates were designated as aviation cadets and were sent to one of the primary flight schools for pilot training. As a result of the Korean War, training populations at Lackland soared to 28 basic military training squadrons (BMTS) within the 3700th Military Training Wing. Temporary facilities, to include 129 "I dormitories", were hastily erected as a quick fix to replace tents cities housing recruits. In 1955 the number of BMTS was reduced to 16, where it remained for the next two decades. The Vietnam War buildup necessitated a "split-phase" training from August 1965 to April 1966. This program provided for 22 days at Lackland and 8 days at a technical school, with directed duty assignees receiving the full 30 days at Lackland. When BMT returned to a single phase on 1 April 1966, it was briefly cut back to 24 days from April to July 1966. After that, basic training stabilized at a length of six weeks. This was the same length as the program used by the Army Air Forces when Lackland opened as a basic training base 20 years before. Training requirements also expanded to include teaching English to Allied military members from foreign countries. No other item in the 1960s compared to the incident that occurred at Lackland in February 1966 with the death of a basic trainee. An airman died of spinal meningitis and while ten other cases were confirmed, no other deaths were reported. Virtually all non-essential activities requiring gatherings of basic trainees were canceled. To control the issue further, a cadre of personnel was assigned to activate the 3330th Basic Military Training School at Amarillo Air Force Base in Amarillo, Texas, in February 1966. As a result of the continuing expansion of the USAF, Amarillo AFB continued to conduct basic training until December 1968. During the 1960s, more permanent facilities were constructed, including four 1,000-person steel and brick Recruit Housing and Training (RH&T) dormitories built between 1966 and 1970 for basic military training by the Lackland Military Training Center. These state-of-the-art buildings included living space, dining halls, and training areas for four basic training squadrons under one roof. Eventually six full-size dormitories, and two 600-person facilities, were constructed, enabling excess space to be converted to classroom use. In late 1951 Air Defense Command selected Lackland Air Force Base as one of twenty-eight radar stations built as part of the second segment of the permanent radar surveillance network. Prompted by the start of the Korean War, on 11 July 1950, the Secretary of the Air Force asked the Secretary of Defense for approval to expedite construction of the second segment of the permanent network. Receiving the Defense Secretary’s approval on 21 July, the Air Force directed the Corps of Engineers to proceed with construction. On 1 February 1953 the 741st Aircraft Control and Warning Squadron was activated at Lackland (P-75) 29°23′16.4″N 98°37′59.9″W﻿ / ﻿29.387889°N 98.633306°W﻿ / 29.387889; -98.633306﻿ (P-75) with an AN/FPS-3 search radar and an AN/FPS-4 height-finder radar. In 1958 the AN/FPS-4 height-finder radar was replaced by AN/FPS-6 and AN/FPS-6A sets. By late 1959 Lackland was also performing air-traffic-control duties for the Federal Aviation Administration. At this time the site hosted an AN/FPS-20A radar. One AN/FPS-6 was retired by 1963. On 31 July 1963, the site was redesignated as NORAD ID Z-75. In 1965 AN/FPS-20A was upgraded to an AN/FPS-91A radar, then in 1969 it was modified to an AN/FPS-66A. The 741st Aircraft Control and Warning Squadron was inactivated in December 1969, and the FAA assumed control of the radar site. In September 1972, the Houston-based 630th Radar Squadron sent a detachment (OL-D) to this FAA-operated site to set up an AN/FPS-6 height-finder radar to join the AN/FPS-66A search radar already in place (Z-241). The Air Force ceased using the Lackland AFB radar site on 30 September 1976. Today the Lackland ADC site has been taken over by the FAA (also known as 'San Antonio') and remains in operation. This now-FAA long-range radar site is now data-tied into the Joint Surveillance System. The site still operates the AN/FPS-66A search radar. From the Cold War demise, base realignment and closure (BRAC) actions in the 1990s relocated several specialized training programs at Lackland. This included Air Education and Training Command's relocation of Air Force Officer Training School (OTS) from Lackland to Maxwell Air Force Base in Montgomery, Alabama. Lackland gained a flying mission when adjacent Kelly Air Force Base closed in 2001. The two-mile-long runway is now a joint-use facility between Lackland AFB and the city of San Antonio. The portion of the former Kelly AFB still under USAF control is now known as Lackland AFB/Kelly Field Annex and its permanently based flying units include the Air Force Reserve Command's (AFRC) 433d Airlift Wing, an Air Mobility Command (AMC)-gained unit flying the C-5 Galaxy and the 149th Fighter Wing of the Texas Air National Guard, an AETC-gained unit flying the F-16 Fighting Falcon. The civilian side of the former Kelly AFB is now known as Port San Antonio and hosts numerous major DoD defense contractors such as Boeing and Lockheed Martin, many of which directly or indirectly support major overhaul and repair of military aircraft previously conducted, and in facilities previously occupied, by the Air Force's former San Antonio Air Logistics Center (SA-ALC) when Kelly was an active Air Force Logistics Command (AFLC) and Air Force Material Command (AFMC) installation. In addition, with the closure of Kelly AFB Lackland gained the section of base known as Security Hill. Security Hill is home to numerous units such as Air Force Space Command's 24th Air Force and 67th Network Warfare Wing and the Air Force Intelligence, Surveillance and Reconnaissance Agency. All units on Security Hill are considered tenant units. Lackland now consists of the Kelly airstrip, Security Hill, main base Lackland, and the old Medina officer training base now named Medina/Lackland Training Annex. With the exception of a few buildings most of the old Kelly air base including the housing has been turned over to civilian jurisdiction. On 15 May 2009, Air Force officials announced that Lackland is the preferred alternative location for the 24th Air Force. In winter of 2009 it was decided to combine all the military bases in San Antonio into one large base named Joint Base San Antonio. In April 2012 Lackland served as an overflow shelter for an influx of illegal immigrant minors after the Administration for Children and Families determined that all other local shelters were filled to capacity. In the sexual assault scandal at the training centre, dozens of female and male recruits said that they were sexually harassed or raped by their instructors from 2010 onward. Trey Soule, center, launches his model rocket during STARBASE Kelly, a five-day summer camp providing math, science and technology education to fourth, fifth and sixth-graders. The following information is from the 2000 census, which treats the base as a town. As of the census of 2000, there are 7,123 people, 174 households, and 152 families residing on the base. The population density is 642.6/km² (1,662.6/mi²). There are 412 housing units at an average density of 37.2/km² (96.2/mi²). The racial makeup of the town is 65.20% White, 19.01% Black or African American, 0.86% Native American, 3.64% Asian, 0.32% Pacific Islander, 2.20% from other races, and 8.77% from two or more races. 13.77% of the population are Hispanic or Latino of any race. There are 174 households out of which 79.9% have children under the age of 18 living with them, 73.0% are married couples living together, 9.2% have a female householder with no husband present, and 12.6% are non-families. 12.1% of all households are made up of individuals. The average household size is 3.49 and the average family size is 3.78. On the base the population is spread out with 5.3% under the age of 18, 79.8% from 18 to 24, 14.5% from 25 to 44, 0.4% from 45 to 64, and none who are 65 years of age or older. The median age is 20 years. For every 100 females there are 256 males. For every 100 females age 18 and over, there are 267.3 males. The median income for a household in the base is $32,250, and the median income for a family is $31,923. Males have a median income of $16,435 versus $15,572 for females. The per capita income for the base is $10,048. 7.3% of the population and 6.9% of families are below the poverty line. Out of the total population, 7.3% of those under the age of 18 are living below the poverty line. ↑ Hernandez, Manny (28 April 2012). "Base Serves as Home for Children Caught at Border". The New York Times. http://www.nytimes.com/2012/04/29/us/some-question-use-of-temporary-shelter-for-children-in-country-illegally.html. Wikimedia Commons has media related to Lackland Air Force Base.